Starred Review "Opening sounds of a whirring airplane propeller lend atmosphere to Hamilton’s reading of Burleigh’s superb picture book, which recounts Earhart’s solo flight across the Atlantic Ocean, in 1932. Reading in crystal clear tones, Hamilton makes aural room for unobtrusive, realistic sound effects (mooing cows, whinnying horses, chirping birds, squawking seagulls, clapping thunder); illustrator Wendell Minor’s impressive gouache-and-watercolor paintings; and Burleigh’s punchy two-line free-verse stanzas as she recounts the heroic story of Earhart’s 2,000-mile flight, in which the intrepid pilot encountered a sudden storm, ice buildup on the plane’s wings, and a cracked exhaust pipe. Hamilton adjusts the stately pace of her reading to reflect Earhart’s anxiety, tenseness, and eventual exaltation. Her reading allows listeners to experience a range of emotions, including uneasiness when “lightning scribbles its zigzag warning across the sky” (a full-page spread of a dramatic, multiforked lightning bolt adds to the mood) and happiness when “a coastline emerges, festered with boulders and crags.” Composer Chris Kubie’s stirring music enhances this fine production, which wisely allows the text and illustrations to take center stage to Hamilton’s impeccable reading, which includes a recitation of the afterword, a listing of Internet resources, a bibliography, and Earhart quotes. This highly recommended title is an inspiring choice and good starting point for students interested in learning more about the heroic aviation pioneer. The price includes a hardcover book." "Robert Burleigh's exciting and well produced biography of Amelia Earhart focuses on her 1932 solo flight across the Atlantic from Newfoundland to Northern Ireland in her single engine Lockheed Vega. Her flight was fraught with danger-from electrical storms to damaged equipment to iced wings. Excellent music sets a tense mood and sound effects of planes and seagulls puts listeners at the center of the action. Wendell Minor's bold gouache and watercolor illustrations complement Burleigh's lyrical prose. Laura Hamilton gives a dramatic reading, doing justice to the author's poetic and intense text. Page-turn signals are optional. The book's back matter, including an afterword, a technical note, Earhart quotes, and bibliography, is included on the CD, but is more helpful in print format. "A fine production of a compelling story." "From Harbour Grace, Newfoundland, in 1932, Amelia Earhart sets off across the Atlantic Ocean, not knowing when or where she will land. Burleigh's vivid text brings to life the story of the first crossing of the Atlantic by a female pilot. Laura Hamilton narrates with precision. Her leisurely pace leaves time to savor the enormity of Earhart's undertaking, Burleigh's rich text, and illustrator Wendell Minor's breathtaking paintings. Hamilton uses extended pauses to portend moments that test Earhart's mettle-a breaking storm, a broken altimeter, iced wings, and a gas leak. Sound effects of the weather and the airplane enliven the story. 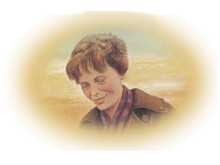 An afterword and back matter provide additional information about Earhart's life."